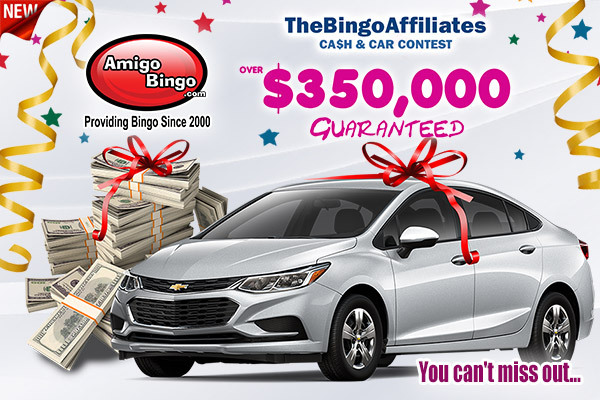 $350,000 CA$H and Car Contest at AmigoBingo! Put the petal to the metal and race on for over $350,000 in GUARANTEED contest games, plus! one lucky member will take home our Grand Prize of $10,000 CASH or a three-year lease on a 2017 Chevy Cruze LS this September 2017. How to participate in the largest contest in TheBingoAffiliates history? The CA$H and Car Give Contest will run on all three of our networks (AmigoBingo.com, CanadianDollarBingo.com, and BingoAustralia.com) between June 1st and August 31st, 2017. Every hour we will play our SPECIAL “CASH or CAR” pattern. Every time you win this pattern you will get 1 Grand Prize entry automatically. Pre-Buys will be allowed for this special contest pattern for the duration of the contest. Winnings across all networks will be allowed and totaled towards the grand prize. To keep the competition exciting we will also offer a weekly contest. This last month of contest you have even more chances to win! How is that possible? Well, we will alternate weekly contest, the 10 winners will race to the top in a top winner ranking or will be randomly selected depending on the week! The more points you collect, the more chances you have to win, but 1 single point could win you an EXTRA prize during the two random draw weeks, everyone will have a fair chance of winning! Hope is not lost for those players who are not so much into Bingo. If they love slots, they can qualify by participating in the Weekly Slot Tournament. If Bingo isn’t your thing, all you need to is play your favorite casino game (Our NEWEST Slots also qualify!). Every time you play we will automatically add up your winnings. Top 10 / random winners depending on the week of the contest, will get Grand Prize Entries and extra prizes. Check out how you can win on weekly basis during the contest month! Just choose your favorite game, win BIG and qualify for the Grand Prize Draw at the same time! Remember, each Cash or Car Pattern win = 1 Grand prize entry. Each win on casino wins = 1 point into the weekly ranking. Bingo and Casino players will get prizes and Grand Prize Entries as per the charts below. Weekly winners will be announced on our Facebook page! Grand Prize Draw - On September 4th, 2017, we will announce the lucky winner of $10,000 CASH or a three-year lease on a 2017 Chevy Cruze LS! All Grand Prize entries will be entered into a random draw to select the winner. The more entries you collect the more chances you have to win, but also 1 single entry could make you the winner! Everybody has a chance when you play at TheBingoAffiliates. Good luck! AmigoBingo is part of the well-established TheBingoAffiliates network offering bingo games to bingo players from all over the world in US dollars. Contest runs every week on the above-specified dates with specific tasks set for each week. Contest patterns will play on all networks 24/7 (AmigoBingo, BingoAustralia, and CanadianDollarBingo). Weekly contests winners will be announced and credited at the end of each contest. Australian players should consider the time zone difference and wait until contests are over in North America. Contest Bingo Cards will cost 25c per card. The Grand Prize winner must provide us with a video (1-minute minimum) to post on our homepage and newsletters before the prize can be credited. Grand Prize – $10,000 Cash If selected, this prize will be paid over 8 weekly payments direct to the member’s account. Payouts from Grand Prize draws do not impact their payout ratio. Or similar version should this model not be available in the country the Grand Prize Winner is located in.The Grand Prize winner is responsible for organizing the lease in the jurisdiction they live along with organizing the insurance needed to drive the cars. Car lease needs to be approved by management at TheBingoAffiliates prior to completion of the lease. Government fees, service contracts and any additional equipment not included in the Vehicle Sales Price. Additional equipment may include "aftermarket" equipment that is installed by the dealer before delivery. The Grand Prize Winner’s payment and/or lease will be completed based on the country and currency their account is defined. This entry was posted in Blog on Aug 12, 2017 by Amigo Bingo.